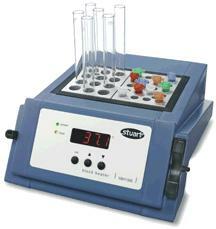 Designed for heating of test-tubes, micro-centrifuge tubes and cuvettes. Digital display with excellent temperature stability of +/-0.1oC at 37oC. Temperature range of +8oC above ambient to 130oC. Aluminum blocks for tubes from 10mm OD to 19mm, 1.5 or 0.5ml micro-centrifuges tubes are available, internal height of 47mm. Please specify on ordering. Each heater requires two blocks. 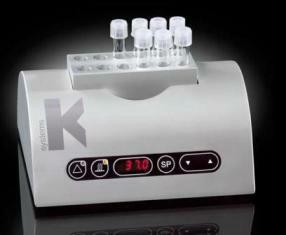 The K-SYSTEMS Dry Bath Incubator, G73, is ideal for all sample tubes requiring a stabe heated environment. The highly visible digital LED display indicates the temperature level in either Celcius or Fahrenheit. The temperature is extremely precise and reliable within the incubator’s range of ambient to 49°C. This is due to the PID controller, which ensures a temperature accuracy of ±0.2°C. The built-in RS 232 communication port provides the option of monitoring and recording temperature stability to a P.D.A. Our wide range of heating blocks makes the G73 Dry Bath Incubator a flexible partner for variety of different laboratory procedures.